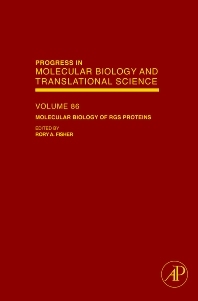 Molecular Biology of RGS Proteins, a volume of Progress in Molecular Biology and Translational Science, will include historical discussion of RGS proteins, the role of RGS proteins in addiction, depression and Parkinson's disease and the biology and functional regulation of RGS9 isoforms. This publication further discusses RGS proteins in cellular signaling, protein control in lymphocyte function, and alternative splicing of RGS transcripts and nuclear RGS proteins, offering the latest in research of RGS proteins. Researchers, professors and graduate students in biochemistry, chemistry, molecular biology, biotechnology, and medicine will value this volume of Progress in Molecular Biology and Translational Science. Dr. Fisher is a 1983 graduate of Iowa State University (Ph.D.), who performed post-doctoral research at the University of Texas Health Science Center, San Antonio, before joining the faculty in Pharmacology at the University of Iowa in 1987. He was promoted to associate professor in 1993 and to professor in 2004. He has a secondary appointment in the Department of Internal Medicine and is a member of the Molecular and Cellular Biology interdisciplinary graduate program, the Holden Cancer Center, the Medical Scientist Training Program, and the Gene Therapy Center. His research focuses on the biology and signaling of RGS proteins and G proteins. He has served on numerous NIH study sections and his funding includes an R01 to study novel actions of RGS6 in tumor suppression and DNA damage signaling.